On March 4, 1861, the day Abraham Lincoln was first sworn into office as President of the United States, the Chicago Tribune printed this special pamphlet of his First Inaugural Address. In the address, the new president appealed to the "mystic chords of memory" and to "the better angels of our nature" to hold the nation together. Seeking to alleviate the "Apprehension [that] seems to exist among the Southern States," Lincoln pledged not to interfere with slavery in the South and pleaded with the Confederate states to reconcile with the North. Twenty times he used the word "Union." But he also sent a clear message that he would not allow the Union to be peacefully dissolved. "We cannot separate," Lincoln declared, and "the Union . . . will constitutionally defend, and maintain itself." Though he wished for a peaceful resolution to the conflicts between the North and the South, Lincoln made clear that the Union would not back down if provoked and would not condone secession: "There needs to be no bloodshed or violence; and there shall be none, unless it be forced upon the national authority." Click here to view all pages of this document. In your hands, my dissatisfied fellow countrymen, and not in mine, is the momentous issue of civil war. The government will not assail you. You can have no conflict, without being yourselves the aggressors. You have no oath registered in Heaven to destroy the government, while I shall have the most solemn one to "preserve, protect and defend" it. Read the document introduction, examine the excerpts, and apply your knowledge of American history as well as evidence from the document in order to answer the questions that follow. 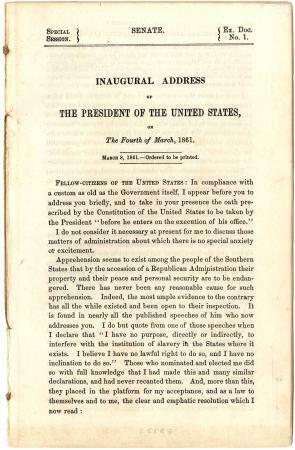 Why were many abolitionists disappointed with the theme of Lincoln’s Inaugural?